The Friends of the Delaware Canal operates as a 501(c)3 non-profit organization. We are governed by an appointed Board of Directors, which selects an Executive Director responsible for the everyday operations of the group. An appointed Advisory Board provides counsel. The Board is responsible for making all administrative decisions for the organization, as well as setting the activity agenda and making sure operations are governed according to the official bylaws of our 501(c)3 non-profit status. Brett Webber, AIA, LEED AP, is Principal of Brett Webber Architects, an award-winning architecture and design firm specializing in high performance, sustainable design. His firm is located in Philadelphia and Bucks County. Brett is active in a number of local organizations, and his firm is a Business Member of the Friends. A longtime champion of industrial and architectural heritage preservation and environmental conservation, Brett adds his professional design and construction expertise to current and future projects. 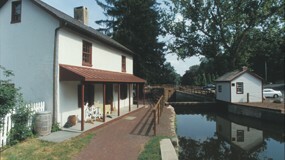 Brett resides in a historic farmhouse in Tinicum Township just above the Canal in Erwinna. Having grown up in Bucks County, the Delaware Canal was always a feature in Laure Duval’s life. In the summer, she could walk the towpath and canoe; in winter, with luck, ice skate. She was taught the Canal’s history by her parents who were Bucks County natives and dedicated conservationists. Her father was a founding member of what is now the Heritage Conservancy and also the Solebury Historical Society. Laure hopes to carry on this family legacy of preserving beautiful Bucks County by doing what she can to get and keep the Canal in working order for future generations. Professionally, Laure was a psychiatrist and lived in New York City while she went to the Columbia University College of Physicians and Surgeons and then began to practice. In 1986, she realized that she was a country girl at heart and moved back to Bucks County. She has resided in Tinicum Township for 30 years while practicing professionally in facilities in Flemington and Clinton, NJ. Laure retired from medical practice in 2016 and is ready to take on some new and not-so-new challenges. The Delaware Canal has much to offer in that line. Jack’s earliest memories of the Canal are of family day trips to New Hope, when he was fortunate enough to be able to experience the mule barge rides. After moving to Bucks County, he learned that the Canal was, indeed, more than just an attraction in New Hope. Jack resides in Erwinna, just above the Canal, and enjoys walking and biking on the towpath in what he considers to be one of the most scenic areas along the waterway’s entire length. 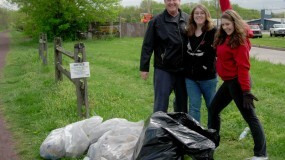 He became involved with the Friends when he was asked to help out with Canal Clean-Up Days. Since then, he has served on the Fundraising Committee, as well as the Advocacy, Restoration and Maintenance Committee, and is also a business member of the Friends. Jack values having the Canal as part of his community and is committed to preserving it for future generations to enjoy as well. Jack is a Real Estate Agent, licensed in both Pennsylvania and New Jersey, and enjoys telling his clients about the Canal, the Friends, and all of the many activities that make this area a special place to live. Larry and his wife, Liz, have lived along the Delaware Canal in Bridgeton Township for the past three years and have been Bucks County resident for over 25 years. He can be found nearly every day walking along the towpath in Upper Black Eddy with his dog, Zoey. A enthusiastic Friends’ volunteer, Larry has participated in annual Clean-Up Days, assisted with the painting of Woody’s Bridge, and is part of the Upper Black Eddy Rapid Response Team (UBERRT), which is comprised of a small group of friends who help to replace missing mile markers along the towpath and clear fallen trees. Larry is active in other community organizations, including the Upper Black Eddy Fire Company, the BNT ( Bridgeton-Nockamixon-Tinicum) Groundwater Management Committee, and was recently elected to serve as the Judge of Elections for Bridgeton Township. Larry is a retired attorney with over 25 years of experience in estates and trusts, and real estate and tax matters. His early retirement from the practice of law gives him time to enjoy the many recreational opportunities that the Canal has to offer. There probably has been no one more determined to walk the full 58.9-mile length of the Delaware Canal than Jeff Connell. On Jeff’s first try at the Friends’ annual Canal Walk in 2009, the group had to turn around and head back to Easton because the Delaware River was flowing over the towpath. He persisted in 2010 and participated in four of the five Canal Walks. In 2011 and 2012, he prevailed and walked on each of the Saturdays detouring around damage and climbing over fallen trees with his fellow Canal Walkers. He now knows the route and routine so well that he served as a tour leader for the Lunch and Walk last March. Jeff and his wife Robin live in Newtown, PA and have a second home in Lanoka Harbor, NJ. A graduate of Rider University, Jeff majored in finance and accounting. He has been a licensed real estate broker in New Jersey since 1978,and was President of the Ocean County Board of Realtors in 2001. Jeff has served on the Board of Directors and Executive Board of the Jersey Shore Council of the Boy Scouts of America since 1992. Both he and Robin are very involved in their communities and have participated in a variety of Friends’ activities and events since they became members in 2010. Jeff is ready and willing to move the Friends’ mission forward. Jack and his wife Claire moved to Bucks County thirteen years ago and were fortunate to find a home on the Canal and the River in Lumberville. It didn’t take them long to develop their interest in the Canal as they got into walking and bike riding on the towpath, and later cross-country skiing and snowshoeing. Early on, Jack bought a used rowboat, which he envisioned using on the Canal, but it has mainly sat on its sawhorses over the years awaiting a nice steady flow of water in the Canal, and it’s still waiting. Over the years Jack has walked the entire length of the Canal, and he would recommend it to everyone. All the diversity of Bucks County’s communities and scenery is played out along the Canal. This will be Jack’s second stint on the Friends’ Board, which he joined about ten years ago, even serving as President for a few years. He has had a hiatus from the Board, but lately has been looking for a way to again become involved with the activities along the Canal, and he knows that becoming more active with the Friends is the best way to do that. Judy and her husband Joe have lived overlooking the Canal Mule Shed in New Hope for the past five years and have been Bucks County residents for twelve. They have been members of the Friends since moving to New Hope, and they are among the board members of New Hope for Our Canal, a community group working under the umbrella of the Friends to keep water in the Canal from Centre Bridge to Lock 11. Judy is Treasurer of the Friends of the Delaware Canal. Judy is now retired from over 30 years of employment in management, financial analysis, and quality improvement; working primarily within the telecommunications industry. She was appointed by the New Hope Borough Council as their representative to the Delaware and Lehigh Trail Alliance and has been active, along with Joe, as an Advisory Board member of the National Foundation for Cancer Research. Judy is also President of the Board of Directors of the Bucks County League of Women Voters, a volunteer at Doylestown Hospital and an active supporter of women’s wellness organizations. She looks forward to seeing our historic Canal flow and flourish once again. For more than twenty years, Joan Fullerton has travelled to Upper Black Eddy on weekends to enjoy life Bucks County-style. The Delaware Canal has played an important role in those weekends, especially since it runs along Joan’s backyard. She enjoys the towpath in every season, especially hiking or biking it, and appreciates its diverse animal, bird and plant life as well as its beauty and tranquility. Along with her appreciation of the Canal’s pleasures came the understanding that the waterway and towpath need more help than the State Park can provide. Thus, Joan became a member of the Friends early in her Upper Black Eddy residency. In recent years, she has been serving on the Friends’ Fundraising Committee taking a key role in the production of Faces and Places in 2012. Now she is pleased to expand her role as a member of the Board of Directors. When not in Upper Black Eddy, Joan lives in Westfield, NJ. She has worked in the international relocation industry for thirty-three years and is currently director of Global Business development for Holman United. She also serves as Treasurer for the International Friends Club. Bob is a licensed Professional Engineer in the Commonwealth of Pennsylvania and a longtime advocate for the Delaware Canal. As a Canal-side resident of Lower Makefield Township for 18 years, he has volunteered for the Friends as a section leader for annual Clean-Up Days and as a Canal Tender. He worked with Pete Sperry on the mile marker project at the time when the first markers were installed. Bob’s background in construction management tends to focus him on the challenges of maintaining the Canal’s physical condition along with its historical context. He recognizes how unique the Canal is and appreciates how fortunate we are to have a National historic Landmark right here in our backyard. Bob and his wife Jen often can be found walking their dog Riley or biking on the towpath. Eileen and her husband Robert live along the Canal in New Hope Borough. Like many other residents and visitors of the Delaware Canal towns, they enjoy and have fond memories of their time along the canal biking, hiking and, not all that long ago, watching mule barges packed with delighted tourists. Eileen is committed to keeping those canal activities alive for all to enjoy. Eileen retired in September 2014 after more than 33 years with Johnson & Johnson pharmaceutical division where she held roles in quality management, research and regulatory affairs. She enjoys volunteer work and currently assists the efforts of the New Hope Garden Club, the New Hope for Our Canal initiative, and H.O.P.E. (Helping Other People Everyday – a volunteer group of individuals who provide assistance to those in need). Always willing to do what’s needed along the Canal, Eileen has participated in Clean-Up Days, daffodil planting, and fish rescues. Pete Rosswaag has been a resident of Upper Black Eddy for 31 years, and feels privileged to have the Canal as his family’s backyard playground. Pete and Joyce raised their two daughters in a house (rebuilt after two floods) located between the Delaware Canal and Delaware River. The Rosswaags thoroughly enjoy the benefits of the towpath – walking, jogging, running, biking, cross-country skiing, and snow shoeing. And they enjoy the waterway by canoeing, kayaking, paddle boating, and ice skating. Their five grandchildren love visiting “paradise” to share in these activities, including frequent trips to the Homestead Store for ice cream. Pete displays his love of the canal by encouraging his grandchildren to assist in his favorite Canal Tender activities of scum busting, vine eradication, and trash collecting via canoe. What fun! He is hoping to make a difference in any way he can, so that future generations can continue to enjoy this unique and wonderful 58.9-mile waterway. Pete worked for the State of New Jersey for 31 years in the Department of Human Services. Currently, he is the Tax Collector for Bridgeton Township. David has lived along the Canal in Lower Makefield Township for over thirty years. By erecting no fences on property lines, he and his hillside neighbors share an expansive view of what they feel is one of the finest stretches of the lower Canal. The continuous water, wildlife (especially the foxes, herons, and spring peepers), and undeveloped flood plain on the River side make it impossible not to love the Canal. With degrees from Brown and Temple, for 35 years David was a software engineer. When relentless squeezing and off shoring caught up with him in May of 2013, David realized that not only would it be extremely challenging to find a satisfactory position at age 61, but his circumstances made that unnecessary. Uncompromising saving and having a spouse with a successful consulting business conspired to make early retirement possible. David welcomes the opportunity to do more for the Canal than admire it and send regular donations to the Friends. his ability to analyze processes and procedures and to make suggestions for change will come in very handy. Nancy, and her husband, Roger Keller, and their black lab, Samantha live between the Delaware Canal and the Delaware River in Upper Black Eddy. Nancy has been a resident of Bridgeton Township for three years, yet has enjoyed the benefits of the Canal and its towpath for over a decade. Having lived in Vermont for 20 years, Nancy has a good appreciation for the value of outdoor recreation, preservation of natural spaces and advocating for policies and programs that allow important historic places to be preserved. This “last towpath canal in America capable of being fully-watered and restored” is a prize that she hopes to assist in building and preserving as well. In retirement, Nancy serves on the boards of Gardener’s Supply Co, The Huntington’s Disease Society of America, and is an Auditor and the Majority Inspector for Bridgeton Township. She is a Master Gardener and a regular yoga practitioner. She hopes to put her decades of professional experience in marketing and publishing to use to benefit the Friends through engaging members in personally delightful activities and bringing the benefits of the Canal to an ever-wider audience.